I’m a firm believer in learning from my mistakes and turning a bad experience into a positive one. I was a victim of fraud twice in my life. The first time, my debit card card was skimmed at a gas station and someone withdrew money from my bank account. The second time I had fraudulent charges on my credit card. After each incident, I felt violated and angry. It was a horrible feeling and I racked my brain trying to figure out what I did wrong. Though it wasn’t entirely my fault (theives are too blame too), I saw that I was complacent with protecting my identity. I had the attitude that it would never happen to me. That is no longer the case. Now I’m more aware that there are people out there actively trying to steal from me if I give them the opportunity. I’m taking measures now to protect myself from identity theft. I made a list of seven things you can start doing today to protect yourself too. 1. Be overly cautious online and on the phone. My guard instantly goes up when I get phone calls from telemarketers. I’m pretty good for smelling out a scam. I get at least a couple calls a month where I’m offered a lower interest rate on my credit card or better yet, a free family vacation somewhere warm. My personal favourite is an offer to fix my “infected” computer. No thanks. I hang up and do not give these callers any information. Same goes for emails. Be careful clicking the links. Instead, I’ll see if my Paypal was really hacked by typing the url into my browser myself. Spam spam spam! 2. Keep a strong password and enable two-step verification, wherever possible. I couldn’t even tell you what all my passwords are because I don’t know them off by heart. I keep a password book by my computer so I can look them up when I need to. They aren’t recognizable at all. I also set up two-step verification on any sites that contain sensitive information like my bank or email. Sometimes it will be a matter of asking me personal verification questions before I can access my account. My email provider will send a text message to my phone if I login at a different IP address. I’ll have to input that code to access my email. It’s worth the extra couple seconds it takes. 3. Don’t access sites with personal or financial information from a public WiFi network. You never who could watching and you don’t want your sensitive information falling into the wrong hands. For instance, if you are traveling and using the hotel’s WiFi, don’t check your bank or Paypal accounts. 4. Keep your virus protection updated on your computer. In addition to viruses slowing down your computer and making the experience a nightmare, you don’t want hackers knowing your sensitive financial and personal information. Keep malware off your computer. John had a computer that was horribly infected with every virus known to man. It was extremely slow and would redirect to spam websites no matter what address you typed in the browser bar. I would never in a million years use it for any purpose. 5. Buy a shredder and use it. Shred any documents with personal information on it especially financial info! Don’t just throw it away even if you crumple it up. Put it in a bin to shred and add it to your chores. Better safe than sorry! 6. Check your bank and credit card statements often. I got complacent with mine and that’s how I ended up being a victim of fraud. Had I carefully looked at my credit card statements, I would have noticed these small monthly charges for a site I didn’t recognize. I learned my lesson. Now I monitor my statements like a hawk. Fool me once, shame on you. Fool me twice, shame on me. If it happens again, I will notice it right away. 7. Monitor your credit score. Remember it’s better to know than not know. Knowledge is power. By keeping tabs on your credit report, you’ll be able to detect fraud and also watch for any errors, which can and do happen! Credit Sesame has free credit monitoring that is worth checking out. Along with the daily free credit monitoring of your credit report, they also provide you with a free monthly credit score and helpful, personalized money-saving advice. No credit card required! The peace of mind it brings is priceless. Always know where you stand. 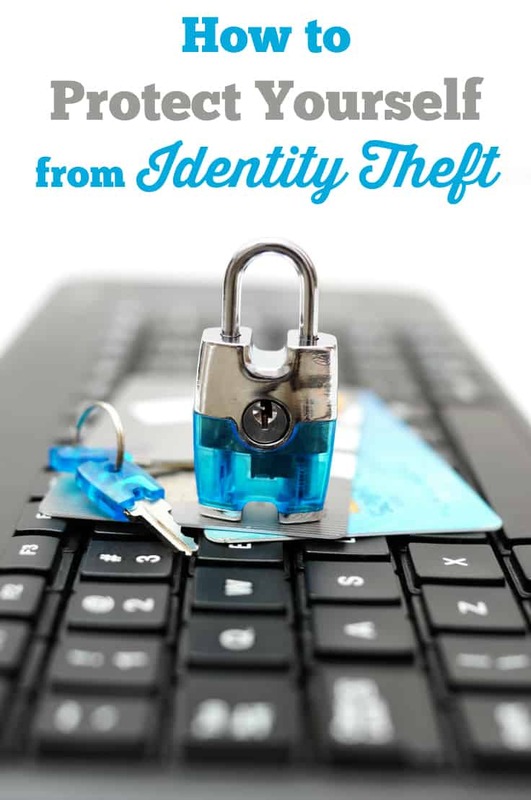 It’s also worth checking out Credit Sesame’s Identity Theft Protection service, another free service they offer to help put your mind at ease. You can sign up for free (no credit card required) and let them monitor and protect your credit and identity in one spot. What steps have you taken to protect your identity? You really have to keep up with everything. Watching statements and checking your computer. We have a great computer guy that we can call out when we do have problems, but we stay up to date on virus protection, too, and talked with him about making strong passwords. Thanks for the great tips. This is an excellent list of tips,I also had charges made to my credit cards a few years ago. These are all great tips, I’m always scared about identity theft, and knock on wood hasn’t happened to me, but it happens to so many elderly people in my area, they fall for all these phone scams and lose thousands of dollars, it’s a shame!! I also have been a victim of debit card theft. It took me a while to get all of the charges reversed. My bank was very good about informing me and cancelling the card. Thanks for the tips. I’ve always been nervous about this- thanks for the tips! I know this all too well. Twice over a course of time. It is the worse type of violation possible. Thank goodness the financial institution was helpful and covered the loses. My email was hacked about two years back and I lost information. Luckily, one of my grandsons is a Computer expert in his field and he regularly checks my computer. I also have a security system on my computer that I run frequently. I also have difficult passwords and have started keeping track of them in a record book. Thank you for your hints.